The tubing, or airline, that runs between your air pump, compressor or blower can be of many types and sizes. Tubing can be buried, trenched or set directly on the surface. Airline comes in both weighted and non-weighted. Often the weighted airline will be used only in the pond and any distance between the compressor and the edge of the lake or pond will be covered by the cheap airhose. Always use an airhose that can handle the rated pressure output of your compressors. MixAirTech® self-sinking hose is one of the best rated aeration hoses available. The 3/8" hose weighs 0.2 lbs per foot. 1/2" is 0.44 lbs per foot. 5/8" is 0.51 lbs per foot. We've seen people using piston pumps delivering 50 PSI that has melted and split cheap airline because the temp ratings and pressure rating were not high enough. All of our tubing can meet or exceed the general tubing, pressure and heating needs of any aeration compressor. Most tubing or airline uses standard plumbing parts and adapters. Often, your compressor will come supplied with a barbed outlet that connects to a rubber collar or sleeve from the compressor. 3/8" self-sinking airline is perfect for small aeration systems where short feeder line runs are required and high pressure air can be delivered. We usually keep tubing runs shorter than 200' and always check the pressure loss and friction drop in the hose according to the pressure and air volume output of your air pump. 1/2" self-sinking airline is perfect for aeration systems where long feeder line runs are required up to 1000 feet. The larger inner diameter of this tubing makes it a popular choice in building large aeration systems in lakes and large ponds. 5/8" self-sinking airline is perfect for aeration systems where long feeder line runs are required (up to 1500 feet). When running airline on land use the non-weighted tubing to save money. Make sure your air compressor, air blower or air pump has the proper balance of available pressure for the CFM requirements of your system diffusers along with any friction loss over long distances with high airflows. Is Weighted Tubing Worth The Money? Using a weighted-airline, without any metals, is great because it cuts the work load by about 95%. Weighted airline is not cheap but the alternative is using regular poly-pipe and attaching bricks or weights and than can take a full crew a day or more of messy knuckle-busting work. Using the weighted hose makes the installation go much faster and for any contractor getting paid by the job this means the distance betwwen quote and paycheck is shorter! All the tubing, weighted or regular 100, 150, 200 or 300 PSI poly, is safe and metal free. Unless you are using the weighted diffuser bubbler tubing for de-icing or aeration which contains a metal bead of lead in the keel. All other tubing is extremely supple and long lsting usually with UV carbon mixed in the PVC or rubber mix to ensure protection from the sun. In larger systems a single compressor, blower or pump will have a single outlet or multiple valve control units that lead to a single diffuser or multiple diffusers. When calculating the required lengths of weighted airline for aeration systems ensure you acknowledge the depth and slope and any obstacles that may be encountered between the final positioning of the compressor unit and the diffusers. Another mysterious yet magical consideration to keep in mind is that the lengths of tubing involved will impact the overall operating pressure of the system which needs to be taken in to account when sizing your compressor pump or blower. In larger ID (Inner Diameter) piping and tubing the pressure or friction loss will be negligable but when lengths of 800 to 2500 feet are involed the pressure required to push 5 CFM to the end may be significant. Generally with larger I.D. tubing there is less pressure loss and friction loss. In smaller ponds this is not really an issue especially if a linear air pump is used to push air in a 3 foot deep pond. In this case some 3/8" weighted airline will be fine...my point is to be very aware of the distances that are required of your tubing and the pressure cababilities of our pump. For example, a standard 100 foot length of weighted airline can add as much as 0.1 PSI to the overall needs of your system and this is before any consuideration is given to the diffusers! Again, in most smaller systems this doesn't enter in to the equation but one interesting experiment that my grand-son got me involved in was to take a 10 foot length of air hose that had an inner diameter of 3/8 of an inch and a 10 foot length of 3/4" of an inch air hose and I literally couldn't believe the difference in the amount of force it took...the smaller bore tubing airline was really tought to push air through and the larger diameter tube was so easy...ok...so none of the compressors I have ever used have red puffed-out cheeks like I did but it sure set me straight!. Using a 100 PSI poly pipe is a great way to save money. A heavy-duty black irrigation hose can be buried and used for running air between the compressor on shore and the distance down to the pond edge. This saves money by allowing you to use only the expensive heavy hose in the water to keep it out of sight. Of course the poly pipe can also be used in the water if weights or bricks are attached along the hose every 6 to 10 feet. Weighted airline can cost an arm and a leg...let's face it...it makes the job much easier but it also costs three times as much as regular airhose. But before you start duct taping jumbo straws together to make an inexpensive DIY airhose think about the job of attaching weights, metal re-bar rods or bricks every 8 feet to a 300 foot length of floating PVC plastic pipe and you might soon change your tune! I really only use the heavy-duty poly air pipe for tubing runs on shore and then switch to the weigfted tubing in the water. There are some cheap tubing available at the home building supply stores but it tends to be too weak for burial and may kink. We recommend using something that is suitable for burial so it should be a kink-resistant and high-density. This tubing CAN be used to run between the compressor and the diffusers in the water but it floats so you'll have to weight it down somehow by attaching bricks or tieing some sort of weight to make it stay at the bottom. It's better to use this inexpensive tubing to run on ground. We usually bury our lines 6 inches deep. You can run it in a conduit if you'd like and you can bury it below the frost line if you insist on over engineering everything! In larger systems a single compressor, blower or pump will have a single outlet or multiple valve control units that lead to a single diffuser or multiple diffusers. When calculating the required lengths of weighted airline for aeration systems ensure you acknowledge the depth and slope and any obstacles that may be encountered between the final positioning of the compressor unit and the diffusers. The 3/8" hose weighs 0.2 lbs per foot. 1/2" is 0.44 lbs per foot. 5/8" is 0.51 lbs per foot. 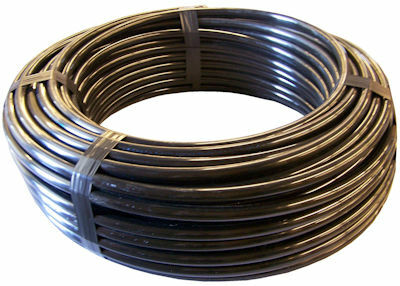 The simplest way to get air to your diffusers without ruining the aesthetics of your pond Virtually invisible once it is connected and in place Extremely durable, does not kink and remains flexible even in cold weather This inside of the tubing has a smooth bore finish so there is less resistance which makes your aeration system more efficient Allows for easier installation, placement and maintenance of diffusers without the hassle of bricks and ties to keep tubing in place . BottomLine Weighted Tubing - sold in 100' and 500' rolls - 15 year warranty The unique tubing remains on the bottom even when filled with air. No additional weights are needed (contains no metal) It is designed for lake and pond aeration, making installation fast clean and neat. Quality assurance guaranteed for maintenance free connections between compressor and diffuser discs and assemblies. 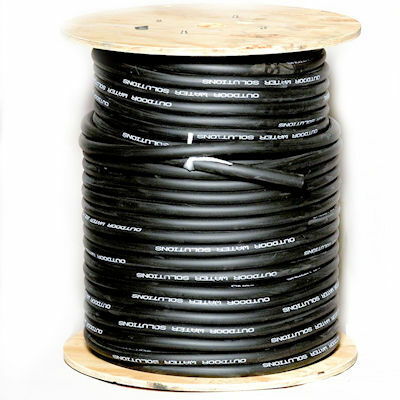 Use this self-weighted, direct burial submersible tubing for connection from compressor to diffuser stations. Tubing shall be of flexible PVC composite construction for use with standard PVC solvent weld cement and 0.5" insert fittings. Aeration Tubing & Feeder Tubing The Environmental Technology system is a fine bubble, low maintenance, economical system that introduces air at the bottom of the watershed which increases the oxygen content of the water and keeps organic matter under control rather than floating or decaying on the bottom. Lakes or ponds normally circulate oxygen naturally. In the summer, the top layers grow warmer and rich in the oxygen while bottom layers stay cold and use up oxygen. During the fall and spring, temperature-density relationships cause the strata to exchange places. BottomLine® Weighted Airline by Vertex is is perfect for aeration systems where long feeder line runs are required (up to 1500 feet). This black line stays on the bottom and requires no weights to keep it down. Makes installations easy and clean. Flexible, non-kinking PVC hose is easy to cu..
1/2" self-sinking airline is perfect for aeration systems where lomg feeder line runs are required (up to 1500 feet). This weighted feeder line stays on the bottom and requires no weights to keep it down. Makes installations easy and clean. Flexible, non-kinking PVC hose is easy to cut and ..
1000 foot bulk orders for large scale projects. Black weighted airline has 0.580" inner diameter with a 0.325" wall thickness for a total outside diameter of 1.05". Sold in rolls of 100' or reels of 500'. Burst pressure is 50 PSI. Air Friction Loss of 5/8" Tubing C..
Poly Non-Weighted Airline - 400 Feet x 5/8" I.D. Tough—20-year warranty! This super-heavy-duty, high-density polyethylene tubing is very kink-resistant. Use this tubing for lake aeration systems and water piping where kink resistance is required. Factory Pressurized is your assurance that it is leak free. Flexible piping is installed much faste.. 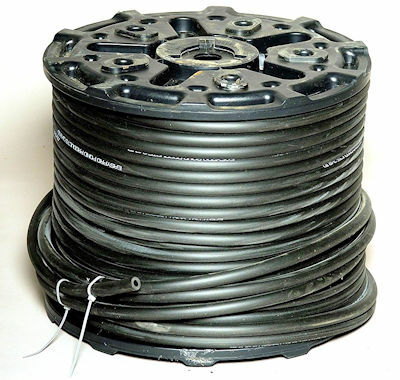 Weighted Airline Feeder Hose - 5/8"
5/8" self-sinking airline is perfect for aeration systems where lomg feeder line runs are required (up to 1500 feet). This blue feeder line stays on the bottom and requires no weights to keep it down. Makes installations easy and clean. Flexible, non-kinking PVC hose is easy to cut and uses..
3/8" self-sinking airline is perfect for small aeration systems where short feeder line runs are required. This weighted feeder line stays on the bottom and requires no weights to keep it down. Makes installations easy and clean. Flexible, non-kinking PVC hose is easy to cut and uses standard 3/8..
1/2" ID poly airline. Available in 100' and 300' rolls. Also available in 5/8", 3/4" and 1" for industrial and large scale projects. 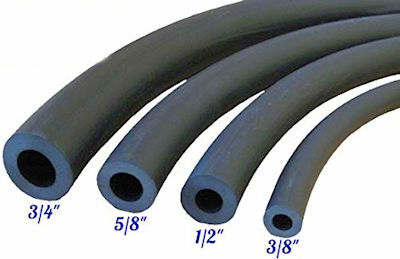 ..
1200' Wholesale Weighted Airline Tubing - 3/4"
This 3/4" Inner Diameter PVS weighted hose is for large scale projects. Black weighted airline has 0.750" inner diameter with a 0.325" wall thickness for a total outside diameter of 1.4". Sold on 300' reels.. Burst pressure is 50 PSI. ..